"The shot heard around the world" was fired on April 19, 1775 at Lexington, Massachusetts. Although this engagement and the one that followed at neighboring Concord weighed against the Americans, their willingness to fight for their rights was at last put to the crucial test, and there was no going back. These initial skirmishes of the American War of Independence came about after years of wrangling between the colonists and the British motherland over irritating taxes and other perceived abuses. The passage of the "Coercive Acts" in 1774 led to the assembly of the First Continental Congress, which met to determine what action should be taken. Sensing that resistance to these new laws would be met with force, Massachusetts formed a Committee of Safety headed by the bold John Hancock. A special militia of "Minute Men" was recruited that would be prepared to take arms on short notice. The British, aware of munitions being stockpiled by the colonists at several locations, drew plans to destroy these arsenals. Their first target was Concord, 21 miles from Boston by road. Early on the morning of April 19, 1775, a force of 700 British troops left Boston headed for Concord. The Committee of Safety, alerted to their mission by its informers, dispatched Paul Revere and William Dawes to summon the Minute Men. Reaching Lexington around midnight, Revere notified John Hancock and Sam Adams of the danger they faced as the targets of royal wrath. Joined by Dr. Samuel Prescott, Revere and Dawes then continued on toward Concord. Luck was not with them that night. Confronted by a British patrol, Revere was captured and Dawes was forced to flee. It was Prescott alone who made his way through to warn the residents of Concord. Reaching Lexington, an advance force of British troops was confronted by armed Minute Men. The Americans were ordered to lay down their weapons and disperse, whereupon a shot rang out, and the British responded with several devastating volleys. Stunned, the unseasoned volunteers scarcely responded, and soon eight Americans lay dead. Only one British soldier was wounded. Unfazed by this engagement, the British continued their march toward Concord to join up with additional units. There, the troops carried out the destruction of whatever military stores they could find before making their return to Boston. By this time, it was high noon. Largely unopposed up to this point, the British now came under the harassing sniper fire of an angered civilian populace. Only by acquiring reinforcements at Lexington were the British able to avoid a total rout and massacre. Such was the determination of Americans to defend their soil and their rights. 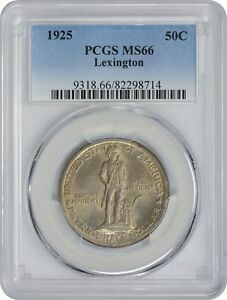 As the 150th anniversary of these battles approached, commemorative coins were sought by each of two civic groups from the towns of Lexington and Concord. 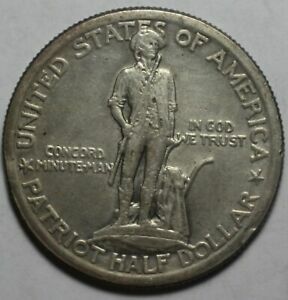 Ultimately joining forces as the United States Lexington-Concord Sesquicentennial Commission, they contracted with sculptor Chester Beach (creator of the 1923-S Monroe Doctrine Centennial half dollar and the 1928 Hawaii Sesquicentennial half dollar) to prepare models based on their sketches. 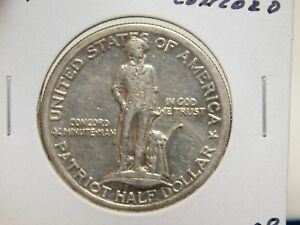 These depicted Daniel Chester French's statue of a Minute Man titled The Grand Concord Man, chosen for the obverse, and the Old Belfry in Lexington from which a single lantern had been lit to warn of the oncoming British, this for the reverse. The coin as ultimately struck looks remarkably similar to the sketches furnished to Beach, even though the artist initially countered with distinctly different depictions of the same two elements. It was only after the usual exchange of correspondence between sculptor, committee and the Commission of Fine Arts that the final arrangement of lettering and other minor features was settled. 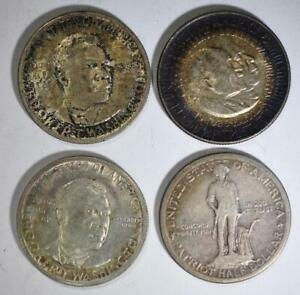 The sculptor member of the Commission, James Earle Fraser of Buffalo nickel fame, argued that the artist ought to be given a free hand in deciding what elements worked best. This plea was seemingly repeated with each new commemorative design, only to be again overruled by politicians and local committees. 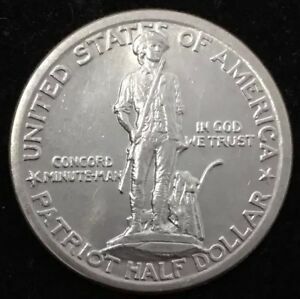 In addition to the Minute Man statue, the obverse of this issue includes the legends UNITED STATES OF AMERICA and PATRIOT HALF DOLLAR separated by stars and the words CONCORD MINUTE MAN. The motto IN GOD WE TRUST completes the design. 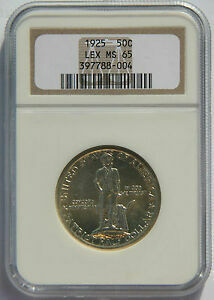 Its reverse is dominated by the famous belfry with the inscription OLD BELFRY, LEXINGTON. 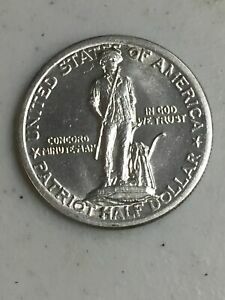 Around the borders are the inscription LEXINGTON-CONCORD SESQUICENTENNIAL and the dual dates 1775-1925. Beach's initials are conspicuously absent. 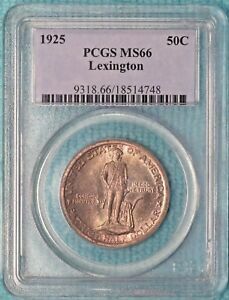 In the meantime, a bill calling for the minting of not more than 300,000 Lexington-Concord half dollars was passed by Congress on January 14, 1925. 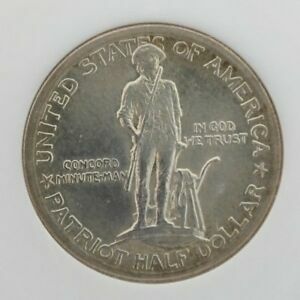 Only 162,099 pieces were actually coined at the Philadelphia Mint during April and May of that year, the odd 99 coins being reserved for the annual assay. From April 18 to 20, a sesquicentennial fair was held at the sites of the historic battles. 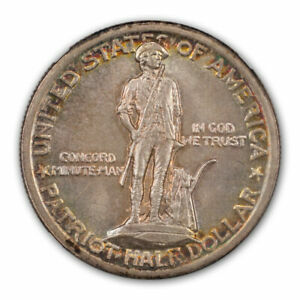 A total of 60,000 coins were sold during those three days, 39,000 in Lexington and 21,000 to fairgoers in Concord. The remaining halves were offered throughout New England and some outlying areas, with these additional sales nearly reaching the number coined. 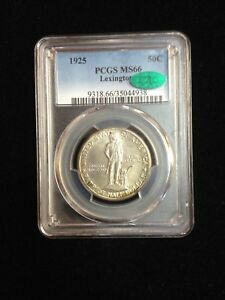 The remaining balance of the 300,000 coins authorized was never produced, as demand for this issue was met with the pieces on hand. Just 86 coins were returned to the mint for melting, leaving a net distribution of 161,914 half dollars. 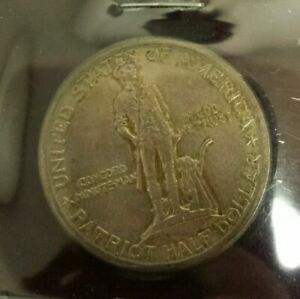 These halves were originally issued at $1 apiece in small, wooden boxes with a sliding lid. 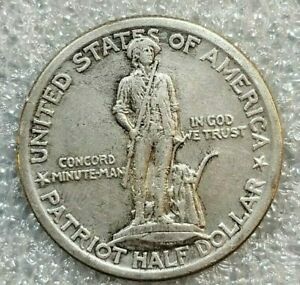 A line drawing of the Concord Minute Man was stamped in blue ink on the top, and the Old Belfry appeared on the bottom. Many of these boxes have been lost over the years, and they have become collectibles in their own right. Other forms of custom packaging were employed by various commercial distributors at the time of issue. 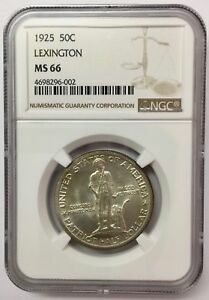 A single matte proof specimen is rumored to exist from the estate of Chief Sculptor-Engraver John R. Sinnock, who was known to have such coins made for his own collection. 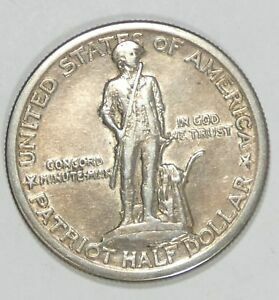 Despite the protests of Chester Beach and James Earle Fraser, the Lexington-Concord half dollar is a handsome coin, one which has always appealed to collectors. 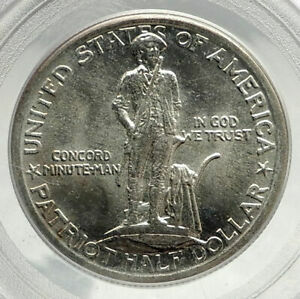 It is readily available in the higher circulated grades of VF through AU and in the lower uncirculated grades of MS-60 through MS-64. 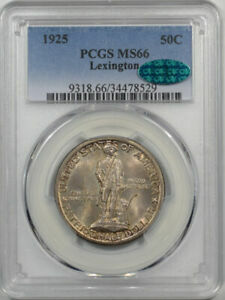 Coins grading MS-65 and above, however, are quite elusive. 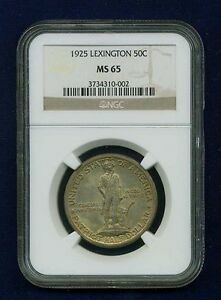 With so many of this issue sold to the general public rather than to numismatists, many have been mishandled or harshly cleaned. Points to check for wear include the Minute Man's thighs and the near corner of the belfry, particularly toward its top. These same highpoints may also show weakness of strike. 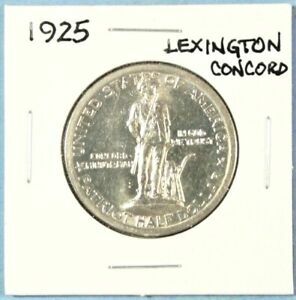 1925 LEXINGTON CONCORD COMMEMORATIVE HALF DOLLAR 50C 3 ECC&C INC.